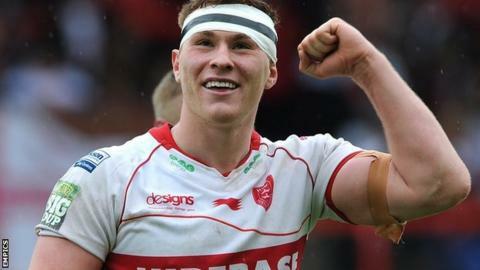 Hull KR prop Scott Taylor is set to leave the club after refusing to enter contract negotiations. The 21-year-old England international still has a year to run on his current deal but is now likely to be sold on. Chairman Nigel Hudgell told the Hull Daily Mail: "We have done all we can to try to tie Scott down longer term but he refuses to negotiate at all. "Inevitably I think that means he has played his last game for us and we will sell him to the highest bidder." He added: "It is a disappointment after what we have invested in him but I am not prepared to be backed into a corner on it and be dictated to by Scott and his agent. "I am quite happy to let anyone go who doesn't want to be here, without exception." Taylor made 25 Super League appearances for the Robins in the 2012 season as they finished 10th to miss out on a place in the play-offs.